It was as close a battle as any we’ve seen on the Figure Olympia stage, but when it was all said and done, a new champion emerged as Erin Stern edged out 2009 winner Nicole Wilkins-Lee in a down-to-the-wire finish that was one of the most exciting in the sport’s history. Stern has been rising steadily up the ranks since she won her pro card at the 2008 NPC Nationals. She placed sixth here last year and won her first pro show, the Europa Show of Champions, earlier this April. After placing second to Wilkins-Lee at the Figure International in March, there was little question that the two would be the marquee matchup in Las Vegas. At yesterday’s prejudging, Stern showed slightly better details and hardness while Wilkins-Lee sported a bit more roundness and fullness. Taking his place on stage along side 10 men who have also won the Mr. Olympia, Jay Cutler must have felt something special in the air. The evening began with a collection of greats who have triumphed in the contest since its inception in 1965 (minus Arnold Schwarzeneggar, who was unable to attend but recorded a speech) and took their place around The Master Blaster himself, Joe Weider. The announcement of his name at the end of the show was still nearly three hours away, but Cutler appeared cool and confident each time he came under the bright lights. He certainly had a few things to worry about, especially from someone so close to him. “Phil Heath is my best friend in bodybuilding,” said Cutler, “and he’s starting to catch up to me.”The man known as The Gift sure is and took the runner-up spot behind his confidant and mentor. Branch Warren, who finished second last year, placed third. Dexter Jackson may have seen his best days already, but The Blade proved that he has plenty left in the tank, placing fourth. Starting with ‘Meet the Olympians’ on Thursday evening, to the finals on both Friday and Saturday, up to the after party, The Orleans will be the place to be. An added plus is that many of the competitors also stay here, so we will be bringing you some behind the scenes material, as well, as we run into the men and women who will be on the big stage. From Jason Dhir –> At 11pm on Saturday night September 25th, history will be made… The doors to HAZE nightclub will open to hold the first ever Official Olympia Party. The Olympia weekend has set the standard for the industries trade shows/competitions bringing in Hollywood celebrities, over the top entertainment and hundreds of pro athletes and models from around the globe. Hence, in order to bring a MEGA-Party such as this to Vegas (similar to what I do annually every March in Columbus, Ohio), there is ultimately only one site on the Vegas strip that can contain this Massive Mastodon of Mega and that is at HAZE Night club located at Aria Hotel/Resort. This will be a new standard in Olympia After-Parties and is held at one next level location. Can You Build More Muscle by Consuming Quickly? Remember how your mom would always tell you to chew your food? She know from what she spoke. Proper chewing of your food not only helps to break down the food mechanically, but also helps to release more digestive-system enzymes to carry the process further. If you don’t chew your food enough, it may result in incomplete digestion. That means there are less nutrients, such as amino acids, getting to your muscles, and this could limit your muscle growth. According to research from Japan, the rate at which you eat your meals may influence the amount of bodyfat you hold. Researchers from the National Institute of Health and Nutrition in Tokyo assessed the eating rate and the amount of food eaten by almost 1,700 female subjects along with their body mass index (the BMI is a way to determine obesity based on weight and height). They reported in a 2003 issue of International Journal of Obesity and Related Metabolic Disorders that the faster the subjects tended to eat their meals, the higher their BMI and, therefore, their body fatness. 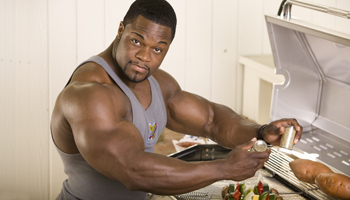 Read moreCan You Build More Muscle by Consuming Quickly? We’ve been monitoring Jason Huh since he won the 2004 Teen Nationals, and even then, as a 188-pound light-heavy, he had above-average calf development. Six years later, he weighed in at 256 pounds this July before winning the super-heavyweight class and overall at the USA Championships. His calves had kept pace with the rest of his ballooning physique. Even amongst the best NPC amateurs, they were still a strong point, as they will surely be when Huh first strides onto an IFBB Pro League stage. One reason for this is that he never takes them for granted. The 26 year old continues to pound his lower legs once per week with high volume and intensity. * He starts with eight sets of seated calf raises to emphasis his soleus muscles. * He pyramids his first four sets of seated calf raises, and then does drop sets on his last four sets. * Huh has tried all rep schemes, but he prefers the middle range of 10-14 for calves, just as he does for other bodyparts. The 2010 Olympia Weekend will be held September 24-26, 2010 in Las Vegas, Nevada at the Orleans Arena and Las Vegas Convention Center. Get comprehensive information right here!